Nicklaus won the U.S. Amateur in 1959 and 1961 and challenged for the 1960 U.S. Open, where he finished in second place, two shots behind Arnold Palmer. Nicklaus turned professional at age 21 toward the end of 1961. He earned his first professional win at the 1962 U.S. Open when he defeated Palmer by three shots in a next day 18-hole playoff. This win over Palmer began the on-course rivalry between the two golf superstars. In 1966, Nicklaus won the Masters Tournament for the second year in a row, becoming the first golfer to achieve this distinction, and also won The Open Championship, completing his career grand slam of major championships. At age 26, he became the youngest to do so at the time. He won another Open Championship in 1970. Between 1971 and 1980, he won an additional nine major championships, overtook Bobby Jones' record of 13 majors, and became the first player to complete double and triple career grand slams of golf's four professional major championships. When Nicklaus claimed his 18th and final major championship at age 46 at the 1986 Masters, he became the tournament's oldest winner. Nicklaus joined the Senior PGA Tour (now known as the PGA Tour Champions) when he became eligible in January 1990, and by April 1996 had won 10 tournaments, including eight major championships despite playing a very limited schedule. He continued to play at least some of the four regular Tour majors until 2005, when he made his final appearances at the Masters Tournament and The Open Championship. Nicklaus was born in Columbus, Ohio and grew up in the suburb of Upper Arlington. He is of German descent, the son of Helen (Schoener) (1909–2000) and Charlie Nicklaus (1913–1970), a pharmacist who ran several businesses named Nicklaus Drug Store. Charlie was a skilled all-round athlete who had played football for the Ohio State Buckeyes and had gone on to play semi-professional football under an assumed name for the Portsmouth Spartans (who later became the NFL's Detroit Lions). Charlie had also been a scratch golfer and local tennis champion in his youth. Charlie Nicklaus died of pancreatic cancer at age fifty six. Nicklaus attended Upper Arlington High School, whose nickname and mascot are coincidentally the Golden Bears. In his senior year, Nicklaus was an honorable mention All-Ohio selection in basketball as a shooting guard, and he received some recruiting interest from college basketball programs, including Ohio State. During his youth, he also competed successfully in football, baseball, tennis, and track and field. Nicklaus took up golf at the age of 10, scoring a 51 at Scioto Country Club for his first nine holes ever played. Charlie Nicklaus had joined Scioto that same year, returning to golf to help heal a volleyball injury. Jack Nicklaus was coached at Scioto by club pro Jack Grout, a Texas-developed contemporary of golf greats Byron Nelson and Ben Hogan; Grout had played quite successfully on the PGA Tour and would become Nicklaus' lifelong golf instructor. Nicklaus overcame a mild case of polio as a 13-year-old. While attending Ohio State, he won the U.S. Amateur twice (1959, 1961), and an NCAA Championship (1961). In the 1959 U.S. Amateur, Nicklaus defeated two-time winner and defending champion Charles Coe 1-up in the final 36-hole match when he birdied the 18th hole. This was significant not only because of Coe's proven ability as a player, but also because Nicklaus became the then-youngest champion in the modern era, second only to Robert A. Gardner, who won in 1909. In 1961, Nicklaus became the first player to win the individual title at the NCAA Championship and the U.S. Amateur in the same year. He was followed by Phil Mickelson (1990), Tiger Woods (1996), Ryan Moore (2004), and Bryson DeChambeau (2015). Nicklaus also won the NCAA Big Ten Conference Championship that year with a 72-hole aggregate of 283, while earlier claiming the Western Amateur in New Orleans. In his second and last U.S. Amateur win in 1961, Nicklaus convincingly defeated Dudley Wysong 8 & 6 at Pebble Beach in the 36-hole championship match. For the week, Nicklaus was 20 strokes under par, including 34 birdies and two eagles. At the 1960 U.S. Open, twenty-year-old Nicklaus shot a two-under par 282, finishing in second place two strokes behind Arnold Palmer, who won the tournament for the only time with a final round charge of six-under-par 65. This score remains the lowest ever by an amateur in the U.S. Open. Nicklaus played the final 36 holes with Ben Hogan, who later remarked that he had just played 36 holes with a kid who should have won by 10 shots. During the final 36 holes, Nicklaus was two-under-par; he had shot every round of the tournament at or below par and was the only entrant to do so. Nicklaus had led by two shots with six holes to play. In 1960, Nicklaus also tied for 13th in the Masters Tournament. He tied for fourth in the 1961 U.S. Open, three shots behind champion Gene Littler, having played the final 54 holes one under par. Each of these three major championship finishes designated Nicklaus as low amateur. However, Nicklaus' one-under-par 287 tied for seventh in the 1961 Masters Tournament, and was second that year only to Charles Coe's low amateur placing, when he tied for second with Arnold Palmer at seven-under par 281, one shot behind champion Gary Player. Nicklaus represented the United States against Great Britain and Ireland on winning Walker Cup teams in both 1959 and 1961, decisively winning both of his matches in each contest. On the 1959 trip to Britain, he also made his only attempt at the British Amateur, the world's oldest international amateur event, at Royal St George's Golf Club, losing 4 & 3 in the quarterfinal round to fellow-American, Bill Hyndman. He was also a member of the victorious 1960 U.S. Eisenhower Trophy team, winning the unofficial individual title by 13 shots over teammate Deane Beman with a four-round score of 269, a record which still stands; this score was 18 shots lower than Ben Hogan's earlier U.S. Open aggregate of 287 at the same site (which had, however, been scored under much tougher conditions). For three straight years (1959–1961), Nicklaus was named the world's top amateur golfer by Golf Digest magazine. Nicklaus attended Ohio State from 1957 to 1961. He majored in pre-pharmacy and had good grades in his first three years; he intended to follow his father into pharmacy after graduation. As his amateur golf achievements mounted, Nicklaus changed his mind on his career path; he switched programs to study insurance. At that stage, he planned to remain an amateur golfer and earn his living by selling insurance. For a time, he worked in the insurance field while he also attended college. He married Barbara Bash (b. 1940), who was a nursing student at Ohio State, in July 1960, and their first of five children, Jack Jr., was born in September 1961, but the following month, Nicklaus was still intent on becoming the first amateur to win the Masters. In early November, he changed his mind and announced that he was turning professional in order to support his family. He wound up a few course hours short of graduating from college. In a goodwill gesture, Ohio State granted him an honorary doctorate in 1972. Nicklaus officially turned professional in late 1961 and began his career on the PGA Tour the following year. He had previously debated the idea of remaining an amateur in order to further emulate his idol, Bobby Jones. However, Nicklaus realized that in order to be regarded as the best, he would have to compete in greater frequency against the best. Shortly after turning professional, Nicklaus' future agent, Mark McCormack, was interviewed by Melbourne Age writer Don Lawrence, who inquired about the American golf scene. When McCormack described Nicklaus, Lawrence referred to the "large, strong, and blond" player as "the Golden Bear", a nickname that would become synonymous with Nicklaus throughout his professional life. However, another possible origination of the name derives from the high school that Nicklaus attended in Upper Arlington, Ohio, which uses the mascot the Golden Bears for its sports teams. As mentioned above, Nicklaus played on several Golden Bears athletic teams, including captaining its 1956 state-champion golf squad, suggesting that McCormack may have adopted the name through Nicklaus' high school affiliation. Regardless, by 1963, the nickname had stuck. Nicklaus won his first PGA tournament in his 17th start. He and Arnold Palmer were tied for the lead at 1962 U.S. Open at Oakmont after Rounds 3 and 4 were played on Saturday. Nicklaus won the Sunday 18-hole playoff and earned $17,500 ($15,000 plus the $2,500 playoff bonus)—far behind Brooks Koepka's $2,160,000 check for the 2018 U.S. Open—for his efforts. The galleries were more vocal in their support for Palmer—who had grown up in nearby Latrobe—but Nicklaus won the playoff by three shots (71 to 74). In 90 holes, Nicklaus had only one three-putt green. The U.S. Open victory made Nicklaus the reigning U.S. Open and U.S. Amateur champion. This major championship win was also his first PGA Tour win. In addition, Nicklaus (22) was the youngest U.S. Open champion since Bobby Jones won at age 21 in 1923, and remained the youngest winner since Jordan Spieth won the 2015 U.S. Open at age 21. (John McDermott is still the youngest winner of the U.S. Open at age 19 in 1911). The U.S. Open win thrust Nicklaus into the national spotlight, and he was featured on the cover of Time magazine. This was also the beginning of the Nicklaus-Palmer rivalry, which attracted viewers to golf on television. By the end of 1962, Nicklaus had won two more tournaments, which were back-to-back in the Seattle Open and Portland Open. In addition, he tied for third in his first appearance in the PGA Championship. Nicklaus completed the year with over $60,000 (equivalent to $496,964 in 2018) in prize money, made 26 of 26 cuts with 16 top-10 finishes, placed third on the PGA Tour money list, and was named Rookie of the Year. He also won the inaugural staging of the World Series of Golf, a select-field event for the year's major champions, and collected another $50,000 (equivalent to $414,136 in 2018) in unofficial money for that win. In 1963, Nicklaus won two of the four majors—the Masters and the PGA Championship. These victories made him the then-youngest winner of the Masters and third-youngest winner of the PGA Championship, and each win came in just his second year as a professional. Earlier in 1963, Nicklaus injured his left hip playing an approach shot from the rough—an injury that would manifest itself years later. Ironically, Nicklaus credits this injury with assisting him in altering his swing heading into the 1963 Masters, thus allowing him to play a draw more easily. Along with three other wins including the Tournament of Champions, he placed second to Arnold Palmer on the PGA Tour money list with just over $100,000 (equivalent to $818,370 in 2018). He also teamed with Palmer to win the Canada Cup (now the World Cup of Golf) in France, representing the United States (this event was shortened to 63 holes due to heavy fog). Nicklaus also finished as low individual scorer for that event. Nicklaus' meteoric rise to fame immediately after turning professional brought opportunities for him to earn significant endorsement income. These business opportunities were facilitated by Mark McCormack, who also managed Palmer and Gary Player. Golf was growing rapidly in popularity and media coverage during the early 1960s, led by the performances of these three star players. This association was the start of the agency that became known as International Management Group, and IMG, after building a base in golf management, eventually expanded into other sports. The Palmer-Nicklaus-Player rivalry developed into the so-called "Big Three" of Golf. In the early 1960s, McCormack set up a series of televised golf matches around the world among the three stars, known as Big Three Golf. In the early 1970s, Nicklaus left IMG to set up his own management agency, Golden Bear Inc. Nicklaus also signed a contract with Eastern Airlines. He could be seen on TV saying, "If you play golf, Eastern is your airline." When Nicklaus won the Masters in 1965 and 1966, he became the tournament's first back-to-back winner and the youngest two-time and three-time winner. He broke Ben Hogan's 72-hole scoring record of 274 in 1953 when he compiled a new aggregate of 271 in the 1965 Masters. This record was tied by Raymond Floyd in 1976 and lasted until Tiger Woods shot 270 in 1997, which was a 72-hole record that was subsequently tied by Jordan Spieth in 2015. When Woods and Spieth shot 270, the scores were achieved with significantly improved golf equipment on essentially the same-length golf course over which Nicklaus and Floyd shot 271. During the 1965 tournament, Nicklaus hit 62 of 72 greens in regulation and had 123 putts, inclusive of just one three-putt green. This was good enough to win by nine shots over Arnold Palmer and Gary Player; this margin of victory was a tournament record that would last for 32 years until Woods won by 12 shots in 1997. The week's performance was highlighted by a third-round 64 that consisted of eight birdies and no bogeys. It was of this round that Nicklaus said, "I had never before and have never since played quite as fine a complete round of golf in a major championship as I did in the third round of the 1965 Masters". This round tied Lloyd Mangrum's record set at Augusta National in 1940 and remained in place until Nick Price shot 63 during the third round in 1986. It was at this time that Bobby Jones stated Nicklaus played a game with which he was unfamiliar; Jones called Nicklaus' result "the greatest performance in all of golfing history". After Nicklaus' record performance at Augusta National in 1965, the course underwent some minor changes to make it tougher. These modifications and the difficult weather in the 1966 tournament did not deter Nicklaus. He successfully defended his title with an even-par aggregate of 288, 17 shots higher. He won in an 18-hole playoff over Gay Brewer (Brewer had three-putted the 18th green to force the playoff but he redeemed himself the following year by winning the tournament) and Tommy Jacobs by shooting a two-under-par 70. Nicklaus led the PGA Tour money list again in 1965 by a healthy margin over Tony Lema. Nicklaus and Lema formed the U.S. team for the World Cup, held in Madrid, Spain, but could not defend the title, as South Africa won. In all, Nicklaus competed in 28 official worldwide events in 1965, accumulating five victories, seven runners-up, 19 top-5 finishes, 23 top-10 finishes, and zero missed cuts. In 1966, Nicklaus also won The Open Championship at Muirfield in Scotland under difficult weather conditions; he used his driver just 17 times because of very heavy rough. This was the only major he had failed to win up to that point. This win made him the youngest player, age 26 (his fifth year on Tour), and the only one after Gene Sarazen, Ben Hogan, and Gary Player (until Tiger Woods at age 24 in 2000, also during his fifth year on Tour) to win all four major championships, now known as the Career Grand Slam. Nicklaus eventually accomplished the double career grand slam in 1971 and the triple career grand slam in 1978, winning all four majors two and three times, respectively. Nicklaus was part of another title for the U.S. in the World Cup in Japan. Nicklaus concluded 1966 playing 22 official worldwide events, with four victories, four runners-up, 14 top-5 finishes, 16 top-10 finishes, and zero missed cuts. In 1967, Nicklaus won the U.S. Open for a second time. The tournament was held at Baltusrol, and he broke Hogan's 72-hole record by one shot with a 275 when he birdied the par 5 18th hole. During the four rounds, Nicklaus hit 61 of 72 greens in regulation. Nicklaus finished this record win with a dramatic 238-yard 1-iron shot, uphill into a breeze and light rain, to the 72nd green (an approximate 260-yard equivalent) and holing out a 22-foot (6.7 m) birdie putt to close out a final nine of 30 and final round of 65 to shoot 275, four shots better than runner-up Arnold Palmer. Nicklaus and Palmer were the only two players to break par for the week. Sports Illustrated ran a cover photo of Nicklaus throwing his leg high in the air with the headline, "Nicklaus Breaks the Open Record". He also finished runner up in The Open Championship and third in the PGA Championship, one shot out of a playoff between Don January and Don Massengale. In 1967, Nicklaus led the PGA Tour money list for the third time. Later that year, Nicklaus and Palmer teamed up for a 13-shot wire-to-wire World Cup victory in Mexico City. Nicklaus competed in 24 official worldwide events in 1967, with five victories, four runners-up, 14 top-5 finishes, 16 top-10 finishes, and one missed cut. For most of his professional career, Nicklaus employed Angelo Argea as his caddie. With his win in the 1971 PGA Championship, Nicklaus became the first golfer to win all four majors twice. In this championship, Nicklaus was the only player to break 70 consecutively in the first two rounds under windy conditions; he finished at seven-under par 281. Nicklaus finished second twice and fifth in the remaining three major championships for the year. While he finished tied for second in the Masters with Johnny Miller, Nicklaus made a big enough impression on a young Nick Faldo (watching on TV in England) in order for Faldo to take up the game seriously. By the end of 1971, Nicklaus had won four additional PGA tournaments including the Tournament of Champions by eight shots and the National Team Championship with Arnold Palmer by six shots. With $244,490 in official PGA Tour earnings, Nicklaus established a new single-season money record during the year. Nicklaus also claimed his third World Cup individual title in 1971, with help from a 63 in the third round. He also won the team competition with partner Lee Trevino by 12 shots. The year 1971 brought Nicklaus a victory in the Australian Dunlop International as well, punctuated by a course record 62 (his career low score in competition; one of three) in the second round. For the record, Nicklaus played in 23 official worldwide events in 1971, won eight, had 17 top-5 finishes, 20 top-10 finishes, and compiled a 5–1–0 record in that year's Ryder Cup competition. Nicklaus won the first two major championships of 1972 by three shots each in wire-to-wire fashion. He won the Masters and the U.S. Open, creating talk of a calendar-year Grand Slam. Nicklaus opened with a four-under-par 68 at Augusta National and never looked back. He was the only player under par for the week as he and the field battled difficult scoring conditions. In the U.S. Open at Pebble Beach again under severe scoring conditions, Nicklaus struck a one-iron on the 218-yard par-three 17th hole during the final round into a stiff, gusty ocean breeze that hit the flagstick and ended up three inches from the cup. The U.S. Open was Nicklaus' 13th career major and tied him with Bobby Jones for career majors (although a different group of tournaments had been considered majors in Jones's time). This victory was also Nicklaus' 11th professional major, tying him with Walter Hagen, and made him the first player to win the U.S. Amateur and U.S. Open championships on the same golf course. During the 1972 PGA Tour season, Nicklaus won seven tournaments and was runner-up in three events. However, Nicklaus did not win the Grand Slam that year, as Lee Trevino repeated as the Open Championship winner (Nicklaus finished second, one shot behind), and Gary Player prevailed in the PGA Championship. Nicklaus closed out this remarkable year with a second of three consecutive Walt Disney World Golf Classic victories by shooting a 21-under par 267 to win by nine shots. He concluded 1972 by competing in 20 official worldwide events winning seven, placing second in four, and compiling 15 top-10 finishes. Bobby Jones' record of majors was soon broken when Nicklaus won the PGA Championship in August 1973 by four shots over Bruce Crampton for his 12th professional major (surpassing Hagen's mark of 11) and 14th overall when using the old-style configuration of Jones' day. In that year he won another six tournaments. When he won the 1973 Ohio King's Island Open, he became the first PGA Tour player to win a Tour event on a course that he designed himself. The PGA Player of the Year was awarded to Nicklaus for the third time, and the second year in a row. Nicklaus was also the first player to win over $300,000.00 in official money for a single season in 1972 at $320,542; he eclipsed that threshold again the following year with $308,362. The former total was $106,137 more than runner-up Lee Trevino. The latter total for the year 1973 catapulted Nicklaus over the $2 million career PGA Tour earnings mark, making him the first player to reach that milestone. Nicklaus teamed with Johnny Miller for another team title in the World Cup of Golf, held in Spain. For the year, Nicklaus competed in 20 official worldwide events and claimed seven victories, 14 top-five finishes, 17 top-10s, and compiled a 4–1–1 record in that year's Ryder Cup competition. Nicklaus' failure to win a major in 1974 was somewhat offset when he won the inaugural Tournament Players Championship and was named one of the 13 original inductees into the World Golf Hall of Fame. Nicklaus said this honor was a "nice memento" after a "disappointing season". Although he had no major championship victories in 1974, Nicklaus still achieved four top-10 finishes in the four events, three of which were in the top four, and placed second on the official money list behind Johnny Miller. While less than a stellar year, Nicklaus was able to claim two victories and 13 top-10 finishes in 20 official worldwide events. During the 1977 Ryder Cup at Royal Lytham & St Annes, Nicklaus approached the PGA of Great Britain about the urgency to improve the competitive level of the contest. The issue had been discussed earlier the same day by both past PGA of America President Henry Poe and British PGA President Lord Derby. Nicklaus pitched his ideas, adding: "It is vital to widen the selection procedures if the Ryder Cup is to continue to enjoy its past prestige." The changes in team selection procedure were approved by descendants of the Samuel Ryder family, along with The PGA of America. The major change was expanding selection procedures to include players from the European Tournament Players' Division, and "that European Members be entitled to play on the team". This meant that professional players on the European Tournament Players' Division, the forerunner to the European Tour we have today, from continental Europe would be eligible to play in the Ryder Cup. When Nicklaus won the 1978 Open Championship at St. Andrews, he became the only player to win each major championship three times. This record was tied by Tiger Woods when he won the 2008 U.S. Open. Nicklaus and Woods are the only two players to win three "Career Grand Slams". Nicklaus considered his performance in the 1978 Open as the finest four days of tee-to-green golf he had ever produced, and was most proud that the win came at St. Andrews, his favorite place to play golf. The victory was also his most emotional to date. Nicklaus won three other tournaments on the PGA Tour in 1978. One of those wins came in the Jackie Gleason-Inverrary Classic, where he played the final 36 holes 13 under par and scored five consecutive birdies over the closing holes in the final round. He also won his third Tournament Players Championship in difficult weather conditions; he had won three of the first five stagings of that tournament, and he remains the championship's only three-time winner. He was named Sportsman of the Year by Sports Illustrated. The year 1978 also marked Nicklaus' sixth and final Australian Open victory. In 1979, Nicklaus suffered a lapse of form and did not win a tournament. This was the first year in his professional career in which he failed to win a PGA Tour event. He had only one runner-up finish, plus a tied-for-second with Ben Crenshaw behind 22-year-old Seve Ballesteros at The Open Championship. He would not win another tournament until June 1980. Previously, Nicklaus won at least one PGA Tour tournament per year (a record he shares with Arnold Palmer), and a minimum of two tournaments per year for 17 consecutive years, and this is another PGA Tour record. During the offseason, Nicklaus addressed two problems that had hurt his performance. His lifelong teacher Jack Grout noticed that he had become much too upright with his full swing, which caused a steep, oblique approach into the ball, compared with a more direct hit; this was corrected by slightly flattening his backswing. Then Nicklaus' short game, never a career strength, was further developed with the help of Phil Rodgers, a friend for more than 20 years, and earlier PGA Tour rival, who had become a fine coach. Rodgers lived for a time at the Nicklaus home while this work was going on. In the 1980 PGA Championship, Nicklaus set another record when he won the tournament by seven shots over Andy Bean at the Oak Hill Country Club; the win was largely due to exceptional putting. Nicklaus shot an even-par 70 in the first round. This was followed by three successive rounds in the 60s over the difficult course, and he was the only player to break par for 72 holes. For the week, the field averaged 74.60 strokes while Nicklaus averaged 68.50. This was Nicklaus' fifth and final victory in the PGA Championship, which elevated him to record-holder for the most wins in the stroke-play era, and which tied him with Walter Hagen for the most wins overall, since Hagen's victories were all during the match-play era. Nicklaus' seven-shot winning margin remained the largest for the stroke-play version of the championship until Rory's McIroy's 2012 victory. This victory also made Nicklaus the only player since Gene Sarazen in 1922 and Ben Hogan in 1948 to win the U.S. Open and PGA Championship the same year (subsequently equaled by Tiger Woods in 2000). This victory was his 18th and final major title. At the 1998 Masters, Nicklaus was 58 when he tied for sixth place despite being hampered by an ever-increasing painful left hip. Nicklaus' five-under par 283 is the lowest 72-hole score in the Masters by a player older than fifty. During the course of a 25-year span (1962–1986), Nicklaus won 18 major championships and finished second 18 times (excluding the second-place finish at the 1960 U.S. Open as an amateur). He also placed third nine times and fourth seven times in this span and was one stroke out of a playoff on five of those occasions (1963 Open Championship, 1967 PGA Championship, 1975 Open Championship, 1977 PGA Championship, and 1979 Masters Tournament). His total span of 73 top-10 finishes over 39 years (1960–1998) is a record in total number as well as longevity among the four major championships and encompassed his tenure from an amateur through the majority of his Champions Tour career. In 2000, Nicklaus played in his final U.S. Open. He shot 73-82 and missed the cut at Pebble Beach Golf Links. This was the same tournament where Tiger Woods won his first Open when he outclassed the nearest competitors by a 15-shot margin. Later in the year, he was paired with Tiger Woods and Vijay Singh in his final PGA Championship, where he missed the cut by one shot only a few days after the death of his 91-year-old mother. In both tournaments, Nicklaus provided last-minute heroics by reaching the par-5 18th in two shots in the U.S. Open and nearly holing his wedge shot for eagle at the par-5 18th in the PGA Championship. Nicklaus played without much preparation in the 2005 Masters, which was a month after the drowning death of his 17-month-old grandson Jake (child of his son Steve) on March 1, 2005. In a written statement, Nicklaus said that it was impossible to put into words the devastation of his family. Nicklaus later spoke emotionally about the tragedy. He said: "It's been an overwhelmingly difficult and trying time for my entire family. The loss of our precious 17-month-old grandson Jake was devastating." Nicklaus and his son Steve played golf as therapy for their grief following Jake's death. After days of playing, Steve suggested his father return to The Masters. He made that his last appearance in the tournament. Nicklaus turned 65 in January that year, which was the last year he could enter The Open Championship as an exempt player. He played with Luke Donald and Tom Watson in his final round. After hitting his tee shot off the 18th tee in the second round, Nicklaus received a ten-minute standing ovation from the crowd. On the eighteenth fairway, he gave his final farewell to professional golf while standing on the iconic Swilken Bridge. Soon afterwards, Nicklaus ended his career with a birdie, holing a 15-foot birdie putt on the 18th green. Nicklaus missed the 36-hole cut with a score of +3 (147). The last competitive tournament in which Nicklaus played in the United States was the Champions Tour's Bayer Advantage Classic in Overland Park, Kansas, on June 13, 2005. On April 8, 2015, Nicklaus hit his first-ever hole-in-one at the Augusta National Golf Club at the age of 75 when participating in the Masters' Par 3 Contest, albeit on the Par 3 Course, while playing with Gary Player and Ben Crenshaw. He hit 20 holes-in-one in professional tournament play at other venues over his career. Nicklaus devotes much of his time to golf course design and operates one of the largest golf design practices in the world. In the mid-1960s, Pete Dye initially requested Nicklaus' opinion in the architecture process of The Golf Club in suburban Columbus, Ohio, and the input increased from that point forward. Nicklaus considered golf course design another facet of the game that kept him involved and offered a challenge. His first design, Harbour Town Golf Links, co-credited with Dye, was opened for play in 1969. The nine-hole, par-3 golf course of Cheeca Resort & Spa was also designed by Nicklaus in the 1960s. A subsequent early, yet more prominent design was Muirfield Village Golf Club in Dublin, OH which opened in 1974 and has hosted the Memorial Tournament since its inception in 1976. This course has also hosted the 1987 Ryder Cup and the 1998 Solheim Cup matches. For the first few years, all of his projects were co-designs with either Pete Dye or Desmond Muirhead, who were two of the leading golf course architects of that era. His first solo design, Glen Abbey Golf Course in Oakville, Ontario, opened for play in 1976. This course served as the host site for the Canadian Open for many years, the first being in 1977. The oldest golf club in the U.S, Saint Andrew's Golf Club in New York, was redesigned by Nicklaus in 1983. In 2000, the King & Bear opened in St. Augustine, Florida, as a joint collaboration between Nicklaus and Arnold Palmer. In 2006, the Concession Golf Club opened in Sarasota, Florida, as a joint collaboration between Nicklaus and Tony Jacklin, to commemorate their historic Ryder Cup singles match in 1969. Nicklaus is in partnership with his four sons and his son-in-law through their company, Nicklaus Design. The company had 299 courses open for play at the end of 2005, which was nearly 1% of all the courses in the world (In 2005 Golf Digest calculated that there were nearly 32,000 golf courses in the world, approximately half of them in the United States.). While the majority of Nicklaus-designed courses are located in the United States, the company has designed golf courses in Asia, Australia, Canada, Europe, and Mexico. For 2009, Nicklaus Design had 12 courses in Golf Digest's "75 Best Golf Resorts in North America". Past and present Senior Design Associates with Nicklaus Design include Chris Cochran, Chet Williams and Dave Heatwole. 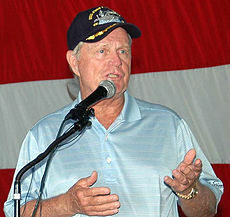 Between 1988 and 1998, Nicklaus also gave his name to promote the successful Jack Nicklaus computer game series published by Accolade. Several of the golf courses he designed were incorporated into the series' various incarnations. In addition, Jack Nicklaus 6: Golden Bear Challenge by Activision was published in 1999. Nicklaus continues to manage the Memorial Tournament, which he founded in his home state of Ohio. The event is played at Muirfield Village, a course that he co-designed with Desmond Muirhead and opened in 1974. The course was officially dedicated on Memorial Day, May 27, 1974, with an exhibition match between Nicklaus and Tom Weiskopf. Nicklaus scored a six-under-par 66, which stood as the course record until 1979. The forerunner to this tournament, the Columbus Pro-Am, had its final year in 1975, and the inaugural Memorial Tournament was held the following year. The tournament is one of the more prestigious events on the PGA Tour. Each year, the tournament selects one or more individuals as honorees who have made a significant impact to the game. The inaugural tournament in 1976 paid tribute to the late Bobby Jones, while the 25th edition in 2000 honored Nicklaus. The honoree is selected by the Captain's Club, a group that acts independently of the tournament organization, but also advises on player invitations and the general conduct of the event. Members of the Captain's Club include Peter Alliss, Peggy Kirk Bell, Sean Connery, Arnold Palmer, and Gary Player among others. The Memorial Tournament continues the PGA Tour's philanthropic focus through its relationships with Central Ohio charities. The most significant of which is its relationship with Nationwide Children's Hospital since 1976. The Memorial Tournament has raised more than $5.7 million to support the programs and services at Nationwide Children's Hospital in those 30-plus years. In 2005 the Memorial made a pledge that will elevate its level of giving to more than $11 million in the coming years. Nicklaus and his wife Barbara serve as honorary chairman and active chairwoman of the Nicklaus Children's Health Care Foundation in North Palm Beach, Florida. The foundation provides valuable programs and services free of charge to more than 4,000 hospitalized children and their families through Child Life programs, the Pediatric Oncology Support Team, and the Safe Kids program. The Nicklauses established "The Jake", a pro-am golf tournament played annually at The Bear's Club in Jupiter, Florida in honor of their 17-month-old grandson who drowned in a hot tub in 2005. It has become the foundation's chief fundraiser. Players such as Robert Allenby]], Raymond Floyd, Tom Watson, Ian Baker-Finch, Ernie Els, Jay Haas, Johnny Miller and Gary Player have participated. Nicklaus and retired General John Shalikashvili, who served as Chairman of the Joint Chiefs of Staff from 1993 to 1997, are serving as honorary chairs for the American Lake Veterans Golf Course capital campaign in Tacoma, Washington. The $4.5 million campaign in 2009 was established to complete the nation's only golf course designed for the rehabilitation of wounded and disabled veterans. The existing nine-hole course is operated, maintained, and managed by 160 volunteers. Funds are needed to add nine new holes and other improvements. A two-day event was held at Bighorn Golf Club at Palm Desert, California featuring Nicklaus, who is donating his design services for the "Nicklaus Nine". In announcing his donation of services, Nicklaus said, "I was moved to see the amazing efforts at American Lake Veterans Golf Course where our wounded warriors learn to play golf with the help of an incredible army of volunteers." Monies raised during the campaign will be used to construct the new holes, complete the construction of the Rehabilitation and Learning Center, make improvements to the original holes to enhance accessibility, upgrade the maintenance facilities and restrooms, and help underwrite operational costs. Nicklaus owns Nicklaus Golf Equipment, which he founded in 1992. Nicklaus Golf Equipment manufactures equipment in three brands: Golden Bear, Jack Nicklaus Signature, and Nicklaus Premium. These brands are designed to target golfers at different stages of golfing ability. He has also been known to reach out[clarification needed]to younger golfers. One notable example came in 1984, when a teenage Canadian golfer who had previously met Nicklaus at an exhibition wrote him for career advice. The young golfer was right-handed but played left-handed; although he was showing considerable promise as a left-hander, he had been told that he might be an even better player if he switched to right-handed play. He wrote Nicklaus asking for advice; Nicklaus replied advising him not to change if he was comfortable playing left-handed. The young Canadian, Mike Weir, decided to stay with left-handed play, and eventually became a Masters champion. He still keeps Nicklaus' letter framed in his home. During his prime, Nicklaus was consistently among the longest and straightest hitters on the PGA Tour. In 1963, he won the long drive contest at the PGA Championship with a belt of 341 yards, 17 inches (312 meters), a record that lasted more than 20 years. He preferred the fade (left-to-right shape) for his ball flight, since this allowed the ball to stop quickly on hard and fast greens. His fades could reach long par fours and par fives in two shots. Nicklaus considers his longest drive in competition to be during the final round of the 1964 Masters on the 15th hole, where he had less than 160 yards left to the 500-yard par five. He hit an eight-iron slightly over the green for his second shot. Nicklaus debuted as a young pro who hit the ball very high. Later, he could also hit lower-trajectory shots as needed. He also developed a right-to-left controlled draw. In 1968, IBM kept PGA Tour statistics. Nicklaus led two categories for the season: he had an average driving distance of 275 yards, and hit 75 percent of greens in regulation; both marks were significantly ahead of his rivals. Even though official PGA Tour statistics were not kept until 1980, Nicklaus was consistently the leader in greens hit in regulation through that year, displaying great command of the long and middle irons. Indeed, Nicklaus remained in the top six of this category through 1985 – far past his best playing years. Nicklaus also finished 10th in driving distance and 13th in driving accuracy in 1980 at age 40, which equated to a "Total Driving" composite of 23 – a statistical level not attained since, by a comfortable margin. Nicklaus led this category through 1982. One key to Nicklaus' ball-striking ability and overall power was his exceptional swing tempo. Of this Tom Watson referred to it as Nicklaus' greatest strength in its ability to remain smooth. This proved an asset, especially under pressure, which allowed him to obtain great distance control with his irons. Nicklaus was the first player to chart and document yardages on the course on a consistent, planned basis. For most of his career, he was not known for his skill on touch shots with the wedges, so he would often play to avoid wedge shots that needed less-than-full swings. Gary Player stated that Nicklaus had "the greatest mind the game has ever known". Nicklaus was not known for being an outstanding putter, but he was often able to make the important putts when they were needed. Nicklaus' putting was highly regarded by his rivals. He was also known as a conservative player at times; he went for broke only when it was necessary. This was especially apparent on the greens, where he would often choose to be less aggressive and make sure of an easy two-putt. Nicklaus spoke about this in his autobiography. "I was a fine two-putter, but sometimes too defensive—too concerned about three-putting—to go for putts that I probably should have gone for." Nicklaus "dotting the i" at the Ohio State Buckeyes football game against Minnesota Golden Gophers at Ohio Stadium on 2006-10-28. Nicklaus can be seen in red in the middle of the field. Nicklaus was inducted into the World Golf Hall of Fame in the inaugural class of 1974 and the Canadian Golf Hall of Fame in 1995. His likeness was featured on a special commemorative issue five-pound note issued by the Royal Bank of Scotland, making him the first living person outside the Royal Family to appear on a British banknote. In 1999 he was on the six man short list for the BBC's Sports Personality of the Century. In 2001, Nicklaus was honored with the "Lombardi Award of Excellence" from the Vince Lombardi Cancer Foundation. The award was created to honor Coach Lombardi's legacy, and is awarded annually to an individual who exemplifies the spirit of the Coach. On May 19, 2014, the United States House of Representatives voted to pass H.R. 2203, a bill that would award Nicklaus the Congressional Gold Medal "in recognition of his service to the nation in promoting excellence and good sportsmanship". The bill says that Nicklaus' "magnetic personality and unfailing sense of kindness and thoughtfulness have endeared him to millions throughout the world". Congressman Thomas Massie objected to a voice vote, and demanded a roll call vote. He then tried to rally opposition to the measure, but the vote passed easily over Massie's objection: 371–10. Nicklaus holds the record for PGA major championships with a total 18; Tiger Woods is in second place with 15. Nicklaus has the third most PGA Tour victories with 73, behind Sam Snead (82) and Tiger Woods (81). Nicklaus also holds the record for the most wins at the Masters with six, and The Players Championship with three. He played on six Ryder Cup teams, captained the team twice and the Presidents Cup team four times, and topped the PGA Tour money list and scoring average eight times each. For 24 straight seasons, from 1960 to 1983 inclusive, he made at least one top ten finish in a major championship, and this is a record. 2 Defeated Tommy Jacobs (2nd) & Gay Brewer (3rd) in 18-hole playoff – Nicklaus (70), Jacobs (72), Brewer (78). 1st, 2nd and 3rd prizes awarded in this playoff. All of the totals above are stand-alone records with the exception of the longest streak of consecutive cuts made in majors at 39 which was equaled by Tiger Woods (1996–2006) and the longest streak of top-10s in majors which is held by Ben Hogan with 18 between 1948 and 1956. 1The Senior British Open was not sanctioned by the circuit then known as the Champions Tour until 2003. ^ Auclair, T.J. "10 Greatest golfers of all time". pga.com. Retrieved May 19, 2017. ^ Chase, Chris (April 13, 2018). "Who is the greatest golfer ever: Tiger or Jack?". USA Today. McLean, Virginia. Retrieved July 14, 2018. ^ Spencer, Reid. The Sporting News selects 50 Greatest Golfers. The Sporting News. ISBN 0-89204-692-9. ^ a b c "1966 Jack Nicklaus". The Open. Archived from the original on October 16, 2013. Retrieved October 18, 2013. ^ "Nellie Helen Schoener Nicklaus (1909–2000)". www.findagrave.com. ^ "Louis Charles "Charlie" Nicklaus (1913–1970)". www.findagrave.com. ^ "Know Jack: Charlie and Helen Nicklaus - Golf Channel". golfchannel.com. ^ a b c d e f g h Nicklaus, Jack; Bowden, Ken (1978). On & Off the Fairway. Simon & Schuster. ISBN 978-0671225681. ^ a b c d O'Connor, Ian (April 11, 2008). Arnie & Jack: Palmer, Nicklaus, and Golf's Greatest Rivalry. Houghton Mifflin. ISBN 0-618-75446-6. ^ "Pancreatic Cancer Action Network Raises Awareness for Pancreatic Cancer". everydayhealth.com. ^ Sounes, Howard (2005). The Wicked Game: Arnold Palmer, Jack Nicklaus, Tiger Woods, and the Story of Modern Golf. William Morrow. ISBN 978-0-06-051386-3. ^ Yocum, Guy (April 2004). "My Shot: Jack Nicklaus". Golf Digest. Retrieved May 22, 2007. ^ a b c d e f g Nicklaus, Jack; Bowden, Ken (1974). Golf My Way. William Heinemann Ltd. ISBN 1-85051-475-5. ^ "Wall's 67 for 132 Keeps Golf Lead; Bolt, Phillips, Nicklaus and Balding Share Second, a Stroke Back, at Akron". The New York Times. UPI. July 4, 1958. ^ a b "Nicklaus wins National Am; nixes pro life". The Bulletin. Bend, Oregon. United Press International. September 21, 1959. p. 3. ^ "Three American's in semi-finals". Glasgow Herald. May 29, 1959. p. 11. ^ "2006 World Amateur Championship Fact Sheet". Retrieved March 17, 2007. ^ "Nicklaus says that he won't turn pro". Ocala Star-Banner. Ocala, Florida. Associated Press. August 24, 1959. p. 8. ^ "Meeting Barbara - Mr. Columbus". ^ Boyette, John (July 23, 2010). "Nicklauses celebrate 50 years". Augusta Chronicle. Retrieved February 25, 2013. ^ "Nicklaus won't turn pro, despite pressure". Milwaukee Sentinel. Associated Press. October 21, 1961. p. 4-part 2. ^ "Attractive bait put to entice Nicklaus". Palm Beach Post. Associated Press. October 24, 1961. p. 14. ^ "Amateurs breathing easy, Jack Nicklaus turns pro". Youngstown Vindicator. Associated Press. November 9, 1961. p. 32. ^ "Amateur king Nicklaus reports he'll turn pro". St. Joseph Gazette. St. Joseph, Missouri. Associated Press. November 9, 1961. p. 7. ^ Grimsley, Will (April 4, 1965). "Nicklaus: none so successful so soon". Sarasota Herald-Tribune. Florida. Associated Press. p. 3D. ^ Wright, Alfred (June 26, 1967). "Jack Delivers The Crusher". Sports Illustrated. ^ a b c d e f Nicklaus, Jack; Bowden, Ken (1997). Jack Nicklaus: My Story. Simon & Schuster. ISBN 978-0-684-83628-7. ^ "The 2008 Ryder Cup – History – 1969". Ryder Cup. Retrieved December 29, 2012. ^ "Yanks great golf good for tie". St. Petersburg Times. AP. September 22, 1969. p. 4-C.
^ "Jack seeks 2nd title sweep". Eugene Register-Guard. Associated Press. August 14, 1970. p. 3B. ^ "Professional Highlights 1970". Nicklaus.com. Archived from the original on December 1, 2008. Retrieved November 11, 2007. ^ Soffian, Seth. "Nicklaus, Woods have major ties". News-Press. Retrieved November 11, 2007. ^ "Jack Nicklaus in the World Golf Hall of Fame". World Golf Hall of Fame. Retrieved January 17, 2014. ^ "Professional Highlights 1974". Nicklaus.com. Archived from the original on January 17, 2010. Retrieved November 11, 2007. ^ "Professional Highlights 1975". Nicklaus.com. Archived from the original on December 1, 2008. Retrieved November 11, 2007. ^ "Professional Highlights 1977". Nicklaus.com. Archived from the original on January 17, 2010. Retrieved November 11, 2007. ^ "Nicklaus rally topples Jones". The Morning Record and Journal. Meriden, Connecticut. UPI. February 27, 1978. p. 10. ^ a b Apfelbaum, Jim, ed. (2007). The Gigantic Book of Golf Quotations. Skyhorse Publishing. ISBN 978-1-60239-014-0. ^ Michaux, Scott (April 3, 2005). "Langer sees time to wear third jacket". The Augusta Chronicle. Archived from the original on July 28, 2009. Retrieved November 11, 2007. ^ "Professional Highlights 1990". Nicklaus.com. Retrieved November 11, 2007. ^ "Professional Highlights 1993". Nicklaus.com. Retrieved November 11, 2007. ^ "Professional Highlights 1994". Nicklaus.com. Retrieved November 11, 2007. ^ "Professional Highlights 1995". Nicklaus.com. Retrieved November 11, 2007. ^ "Professional Highlights 1996". Nicklaus.com. Retrieved November 11, 2007. ^ Garity, John (June 26, 2000). "Open and Shut". Sports Illustrated. Archived from the original on June 3, 2009. Retrieved December 18, 2008. ^ "Grieving Nicklaus plays to honour wish of late mother" – via The Globe and Mail. ^ Denney, Bob. "The Pairings Challenge". Retrieved December 18, 2008. ^ "Major Championship Performances". Nicklaus.com. Retrieved November 8, 2007. ^ "Nicklaus to Focus Attention on Family". Washington Post. March 25, 2005. Retrieved December 29, 2012. ^ Van Brimmer, Adam (April 9, 2005). "Golden Bear says goodbye". Morris News Service. Archived from the original on July 28, 2009. Retrieved November 11, 2007. ^ "Nicklaus set for St Andrews bow". BBC Sport. July 3, 2005. Retrieved November 11, 2007. ^ "Nicklaus set for St Andrews bow". BBC Sport. Retrieved March 4, 2014. ^ Slater, Matt (July 15, 2005). "Woods shines as Nicklaus bows out". BBC Sport. Retrieved November 11, 2007. ^ "Swilcan Bridge replica a true World Golf Hall of Fame highlight". PGA of America. Retrieved March 4, 2014. ^ a b "Jack Nicklaus Bio". Archived from the original on November 2, 2007. Retrieved November 8, 2007. ^ Newport, Kyle (April 8, 2015). "75-Year-Old Jack Nicklaus Picks Up an Ace at 2015 Masters Par 3 Contest". Bleacher Report. ^ "Facts and Figures" (PDF). www.nicklaus.com. Retrieved July 20, 2016. ^ a b "Nicklaus Design". Nicklaus.com. Retrieved November 8, 2007. ^ Blackerby, Cheryl (April 28, 2017). "Cheeca Lodge in the Upper Keys a historic hotspot for presidents". Palm Beach Daily News. Retrieved August 20, 2018. ^ Goodhue, David (January 27, 2018). "Cheeca to reopen March 30". FLKeysNews.com. Retrieved August 20, 2018. ^ Kirkman, Alexandra (January 31, 2015). "The Perfect Winter Weekend Getaway: Cheeca Lodge & Spa in the Florida Keys". Forbes. Retrieved August 20, 2018. ^ "Glen Abbey: Overview". Archived from the original on September 18, 2009. Retrieved December 21, 2008. ^ "RBC Canadian Open". Archived from the original on September 28, 2009. Retrieved December 21, 2008. ^ "Golf". Saint Andrews Golf Club. Retrieved December 9, 2017. ^ "Golf in Europe". VisitEurope.com. Archived from the original on December 19, 2007. Retrieved November 8, 2007. ^ Finch, Peter; Sjoleder, Jay (October 18, 2011). "The 75 Best Golf Resorts". Golf Digest. Retrieved February 27, 2019. ^ "Lionsgate". Retrieved April 9, 2012. ^ "Ritz Carlton". Retrieved April 9, 2012. ^ "The Cliffs". Retrieved April 9, 2012. ^ "U.S. Open Preview". Entertainment Weekly. Retrieved December 21, 2008. ^ "Nicklaus Golf Equipment Company Profile". Retrieved December 22, 2008. ^ "Nicklaus Golf Equipment". Retrieved December 22, 2008. ^ Feinstein, John (2010). Moment of Glory: The Year Underdogs Ruled Golf. New York: Little, Brown and Company. pp. 36–37. ISBN 0-316-02531-3. ^ "Jack Nicklaus Wines: Overview". Archived from the original on February 16, 2013. Retrieved January 17, 2014. ^ "Golf Legend Jack Nicklaus Introduces a Napa Cabernet". May 27, 2010. ^ "Ball-striking". NBC Sports. Retrieved December 23, 2008. ^ "Course Management". NBC Sports. Retrieved December 23, 2008. ^ "Putting". NBC Sports. Retrieved December 23, 2008. ^ "The Royal Bank of Scotland Group to Issue Special Commemorative £5 Note in Honour of Jack Nicklaus" (Press release). Edinburgh: Royal Bank of Scotland Group. July 12, 2006. Archived from the original on September 28, 2011. Retrieved September 21, 2009. ^ "Our Banknotes: Learn more here about the banknotes we've issued since 1987". Edinburgh: Royal Bank of Scotland Group. September 17, 2009. Archived from the original on January 27, 2010. Retrieved September 21, 2009. ^ "High Fives for Golden Bear". Rampant Scotland. December 24, 2005. Retrieved October 20, 2008. ^ "Ali crowned Sportsman of Century". BBC Sport. December 13, 1999. Retrieved March 30, 2017. ^ "Nicklaus Museum". NicklausMuseum.com. Retrieved November 11, 2007. 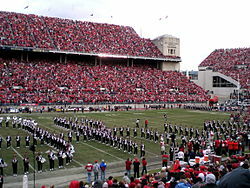 ^ "Strike up the band: Nicklaus dots 'i' at Ohio State". ESPN. Associated Press. October 28, 2006. ^ "Phi Gamma Delta". Archived from the original on September 29, 2007. Retrieved November 11, 2007. ^ "H.R. 2203 - Summary". United States Congress. Retrieved May 20, 2014. ^ Marcos, Cristina (May 19, 2014). "House votes to award medals to 'Monuments Men,' Jack Nicklaus". The Hill. Retrieved May 20, 2014. ^ a b Shesgreen, Deirdre (June 15, 2014). "A congressman thinks 'no' is the answer". Cincinnati.com.